Common pitfalls could leave landlords hundreds of thousands of dollars out of pocket thanks to sub-standard insurance, according to the new ebook 12 Most Common Pitfalls When Insuring Your Rental Property. The book was written by Brett Clarke, who has more than 20 years experience in landlord insurance. œThe simple fact that not all insurance is the same makes it extremely difficult to weigh up the benefits of one policy versus another, and so often the glossiest brochure or cheapest price wins out,Â says Brett, EBM™s National Marketing & Development Manager. 1. Buying on price alone ” look for œvalueÂ not œcheapÂ. 2. Deliberate fire by tenants ” some policies exclude this. 3. Excess ” how much, and can the bond be used as payment? 4. Underinsurance ” insuring for less than true replacement value. 5. Malicious damage by the tenant ” is it covered? 6. Accidental damage ” some insurers limit cover to the contents not the building. 7. Check the qualifying (or disqualifying rules) ” beware the fine print. 8. Check for complete cover ” some combined house and landlord policies offer less cover than specialist landlord policies. 9. Court orders ” do you need a court order to claim for rent default? 10. The Body Corporate already insures my property ” not for liability if someone hurts themselves inside. 11. Periodic tenancies or lease continuation ” some won't pay out for claims if the written lease has expired. 12. When you figure out œyou don™t need insuranceÂ ” a reliable tenant and a good property manager is not enough to protect you. One in 10 Australian adults invests in property, according to recently released Australian Tax Office (ATO) statistics. The same figures show that the number of people investing in real estate is growing ” even though two thirds reported a loss to the tax man. There were 1.77 million landlords in the 2010-11 tax year compared to 1.70 million the previous year. 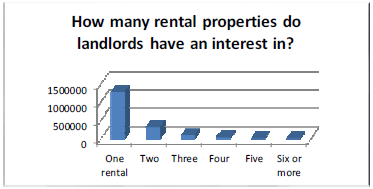 Almost three-quarters of landlords owned or had an interest in only one rental property. RentCover General Manager Sharon Fox-Slater said many investors were capable of owning more investment properties than they had. The RentCover Report also used Australian Bureau of Statistics population figures for 2011 in calculating some of the above figures.